When I moved from the UK to Ireland in 2015/16 my transition in terms of the availability of television was relatively easy. Given that many of the same channels, subscription packages and streaming services span both the UK and Ireland, it felt more that my television viewing was enhanced by the re-introduction of Irish terrestrial broadcast channels such as RTE 1 & RTE 2, TV3, Irish language channel TG4 and even some local channels such as Irish TV. The initial experience seemed to be the positive consequence of the global and transnational distribution of television enabled by the growth of multi-territorial deals, online television viewing platforms and subscription services and a more globally integrated viewing culture (including, for example, television criticisms and reviews). But my idealism has been continuously tested by the imposition of national and territorial frameworks more typical of the broadcast era on a viewing culture that reaches out more globally. Regardless of how transnational I may feel and how my viewing practices have extended beyond nationally-rooted television content, all of these are impeded and restricted by moves that enforce television territorialism on me. Of course, I understand the economic imperatives that necessitate boundary formation but this brushes hard against a television culture that is far less determined by national boundaries. As a result, my television practice now includes social media blackouts (to avoid the ‘can’t believe [insert name of key character] died in last night’s [insert name of show that has a staggered release window]’ tweets), streaming on all sorts of websites when I can locate the latest episode of an unavailable television show, and the use of VPNs in an attempt to access television shows I feel committed to but are no longer available due to national restrictions. There are rigorous efforts to prevent the latter two for viewers of television in Ireland through the geo-blocking of content and restriction on VPN use (in the case of the BBC iPlayer and Netflix) as well as the recent efforts by a number of major film & TV studios to compel Internet Service Providers to block access to streaming sites. The Irish television landscape, for those unfamiliar with it, is similar to that of the UK, with a public service model and license fee, along with a range of free to air channels (Saorview), cable subscription packages (UCP) as well as satellite (Sky) alongside the same subscription packages as that offered via Netflix and Amazon Prime. 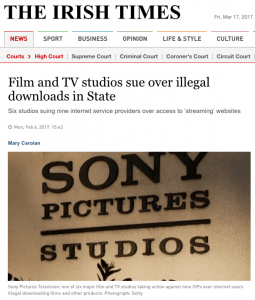 If we include more unsanctioned practices in television consumption such as using Android boxes to stream television, Ireland has a higher rate of digital piracy (including downloading and streaming) than the UK. It is perhaps telling that the Irish engage in piracy at higher rates than in the UK since there is less availability of non-Irish television shows on basic television packages. Equally, the Irish have historically high rates of immigration, matched more recently with significant rates of return (and I would be included in this group). In other words, television viewership likely includes those who have had access to television elsewhere and perhaps wish to retain their viewing habits where possible. Ireland also has high rates of viewing more generally, with the average daily viewing per adult at 3 hours and 21 minutes and 24% of Irish households having a Netflix subscription. This is indicative of the place of the Irish within the local and the global, having both an affinity for the national while also engaging with the global. In this sense, the efforts to impose television structured in terms of the nation-state or within the parameters of territorial distribution has caused tension. As a small nation, Ireland already has a particular relationship with larger nations. This relationship is represented as and perceived to be mutually beneficial, for example in the economic schemes that support foreign direct investment or encourage foreign audio-visual production in Ireland. Equally, the Irish are said to have distinct cultural capital that can be exploited either through the export of Irish creative products and services or the leveraging of Irish culture to promote tourism. However, in the context of Irish television, this relationship to the global is reversed, with the Irish importing more television than exporting it. Non-Irish television includes that broadcast on terrestrial Irish television (such as programmes aired on the Irish channels) and often after original broadcast dates. A number of UK terrestrial channels such as BBC1 and 2 and Channel 4 are also available on cable packages for many Irish television viewers. Satellite subscription packages provide a range of foreign programmes across multiple channels (for example BT Sports or Sky Atlantic) and, finally, Irish television viewers can stream international television through subscription packages. Therefore, Irish television viewers clearly have an appetite for as well as an abundance of non-Irish television legitimately available albeit often at a cost or available after initial broadcast. In this context it is interesting to note the tensions that have arisen in relation to the accessibility of foreign television to Irish viewers as well as the growing instances of restriction of access to, in particular, television online. On the one hand, Irish viewers benefit from the availability of foreign channels and online platforms, whereby the historic broadcast of UK channels in Ireland and the current foreign owned subscription packages on offer work to encourage and facilitate the Irish viewers’ transnational television consumption. On the other hand, various moves by television producers and distributors to control and curtail ‘illegitimate’ television viewing in Ireland demonstrates the extent to which television is global at the level of industry but national in terms of how Irish viewers are constituted, regulated and restricted. We are left with a situation whereby Irish viewers are cognisant of the television that is distributed and watched elsewhere, but prevented from accessing it due to rights holders’ efforts to sanction or stop such activity. In fact, it would almost appear that the globalisation of television, at least in the context of Irish viewers, is in reverse, with television that was once available now blocked. 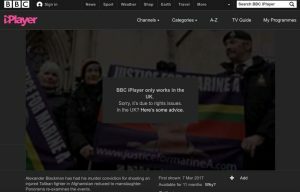 This is the case with the BBC iPlayer and with Netflix’s block of account-holders’ use of VPNs to access different territories. While efforts are being made at the EU level to generate a Digital Single Market whereby subscribers to packages such as Netflix or Now TV can access their service while abroad, the issue of restricted access to foreign operated services while based in a home country remains. On home soil, Irish viewers of television are seeing the doors closed on a number of fronts. The recent instigation of court proceedings by media industries to compel Irish Internet Service Providers to block unsanctioned streaming sites is representative of the tenuous relationship between television makers and Irish television viewers, 1.3 million of whom apparently access content illegally (although streaming is at best a legally grey practice). While 1.3 million seems slightly suspect given a population of approximately 4.5 million, it does, if anything, suggest that there’s a television gap that needs filling. It is perhaps ironic that Irish television viewers are being re-territorialised on precisely that platform that promised de-territorialisation. The prospect that the internet could reflect the historic nature of the Irish identity as both national and global appears dim now in the wake of those series of steps aimed at restricting access to television online. Irish viewers are penalised by fact of geography (much like many smaller nations) and prevented from engaging with wider and more global television viewership, something that is quite important given the persistence of scheduled broadcast. 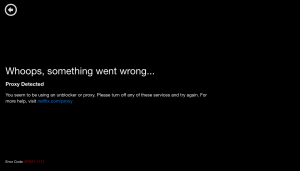 This feels to be in many ways disconnected, not only in terms of being blocked from viewing particular shows, but in terms of being disconnected from the supranational conversations about television. In the end, it suggests that Irish television viewers don’t matter and results in them being in tension with television makers and distributors. In my own case, it feels additionally ironic to return home to engrain myself in Irishness, only to adopt digital tools and applications that erase and conceal that very identity. All to watch the television I had become accustomed to. Sarah Arnold is Lecturer in Gender & Production Studies at Maynooth University. She is preparing the book Television, Technology and Gender: New Platforms and New Audiences. Her previous books include Maternal Horror Film: Melodrama and Motherhood and the co-authored Film Handbook. Her research focuses on viewing spaces and environments of television and film, particularly in the context of gender and emergent technologies. 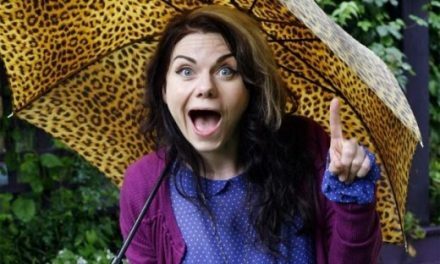 She is a regular contributor to the Critical Studies in Television blog.